The purpose of this widget is to show a preset amount of members who have logged in recently or are currently active on the forum. 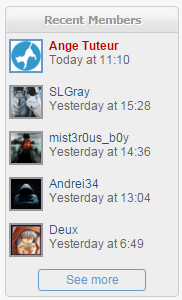 Users that are currently online are indicated by a blue border around their avatar. The list is updated asynchronously every 5 minutes. So if you're just sitting on the page and the specified cache time passes, the widget will be updated without refreshing the page. To install this widget go to Admin Panel > Modules > Forum widgets management and create a new widget with the following settings. When you're finished, click the save button and then proceed to adding the widget wherever you want it ! If you want to make some changes please see the next section. Below are some settings that you can change in the widget. amount : This variable affects the amount of users displayed in the widget. Currently it is set to 5, you can change this to a higher or lower value to show more or less members. refreshRate : This variable determines how frequently the widget checks to see if the cached data has expired. If it has expired the widget will then update the recent members list. onlineIndicator : This variable allows you to choose whether or not to show the online indicator. Set it to false if you want to disable the online indicator. style : Lastly if you want to make changes to the style of the widget you can make them by modifying the CSS in the stylesheet at the top of the widget. If you have any questions or comments feel free to leave them below. Anyway, I hope you like this widget and have fun spying on your members ! Thanks @Ange Tuteur for posting this tutorial. It works great on my two forums. 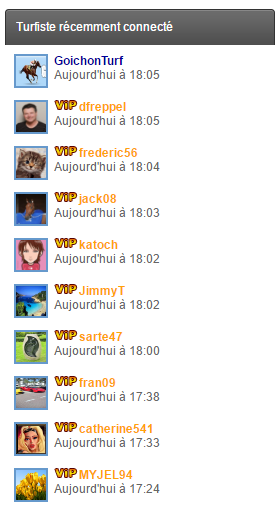 ma question : le code est parfait, mais peut-on inverser la liste des membres qui viennent de s'inscrire ? Donc le premier de la liste serai le dernier membres inscrits . You can change what's shown by editing the query "mode=joined" to any of the queries below. Sorry for the delay, I was off for the holiday and weekend. Pour commencer merci infiniment de ton professionnalisme, je t'admire.